Lancashire-based Huntapac Produce has speared a unique deal with Booths to be its exclusive supplier of asparagus this Spring. The family-run business is set to supply its entire range of hand-cut Formby Coast asparagus to the North West retailer during the delicacy’s short, two-month season. Bunches, fine, fine tips and individual loose wonky spears will be available at Booths stores from May until just shortly after Midsummer’s Day, which is traditionally the date when all British asparagus growers stop cutting. 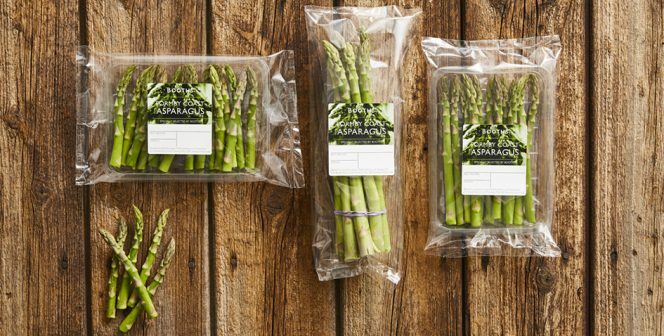 And, for the first time, Huntapac will be supplying its packaged asparagus – the fine and fine tips – in clear, recyclable plastic punnets. The Formby region has long been associated with asparagus and during the 1930s more than 200 acres were under cultivation in the region. Stephen Shields, Technical Director at Tarleton based Huntapac Produce, said the asparagus season is always a special time of year. Booths buyer, Tom Hargreaves, said they were looking forward to supplying Formby Coast asparagus to their 28 stores across Lancashire, Cheshire, Cumbria and Yorkshire. Huntapac operates its own washing, grading, packing and distribution operations, which feature a range of modern technology and innovative solutions including using recycled water and solar power to reduce its environmental impact. Picture Caption: (L-R) Stephen Shields Technical Director at Huntapac and Tom Hargreaves, Booths Buyer.